When asked about Ben’s role as far as leadership, Rooney said he already considers Ben a team leader, “He will be somebody that perhaps is looked to more now than in the past. Maybe that leadership role will grow as we move forward.” — From Scott Brown, Pittsburgh Tribune Review, on twitter after his interview with Mr. Rooney today. The Steelers want to sign wide receiver Mike Wallace to a long-term contract, though team president Art Rooney II said today that he doesn’t know when a deal might get done. “The sooner the better as far as we’re concerned but there’s two parties to it,” Rooney told the Tribune-Review. What does Ben think of Wallace returning to the Steelers? If you missed his interview you can listen to it here. Andrew Luck showed he could do it all at Stanford’s Pro Day on Thursday: throw a 70-yard pass, throw the out pattern, hit a receiver in stride, even avoid the pass rush. A pass rush that was tall and long, persistent and bristling. Okay, okay, so the pass rush was really a broom, a Home Depot sale item that quarterback guru George Whitfield was waving around in Luck’s face. But Luck still avoided it. Whitfield — who worked with Cam Newton last year and has been helping Luck prepare for the draft — harassed Luck with the broom on about half his throws. It must have been unnerving for the Colts to see their new toy batted around like a piñata, but Whitfield said the broom allows him to manipulate the way the quarterback has to move. 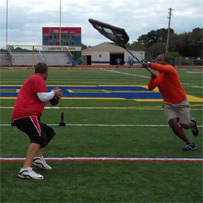 When he worked with Ben Roethlisberger (photo), Whitfield wanted to simulate his pocket feel and adrenaline rush. “So I went out and got one of those giant plastic rakes, lined it with foam, wrapped it in bubble wrap and went after him,” Whitfield said. You can see a larger version of the photo here. …these two photos of Steeler Nation families at their finest! …this great shot of Ben signing autographs last year at training camp, taken by fan Diane Durst. 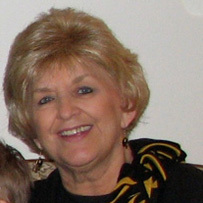 Steeler Nation, please keep Mrs. Washlock in your thoughts and prayers!